Posted on May 15, 2018 - By Fucosoft | Follow YouTube, Twitter to Get More Information. Sometimes you may need to convert video into different formats, and free video converter software is a great choice. What if you don’t want to download and install any video converter program on your computer? An online video converter can help. Here is a list of the 5 best free online video converters available today. Read on to find the best sites to convert your videos for playback on specific player or device. Online Video Converter is the NO.1 free online media conversion application that allows you to convert video to various formats without installing a program on your computer. Also, you can direct convert video link from YouTube, Dailymotion and Vimeo to various video/audio formats including MP4. AVI, MKV, MP3, AAC, etc. It is easy to use, and you only need to enter video link or upload the video file, select the format, and click the “Start” button. Please note the max video file size is 3,072MB. Online Convert is one of the best free online video converter for PC & Mac, letting you convert video file or video URL to various formats like MP4, AVI, MKV, MOV, FLV, 3GP, 3G2, etc. Also, it provides preprogrammed device profile for you to convert video to iPhone, iPad, PS3, etc. In addition to convert video, it allows you to convert audio, image, ebook, document, and more. Please note you can only convert video smaller than 100M, or you have to buy their service. 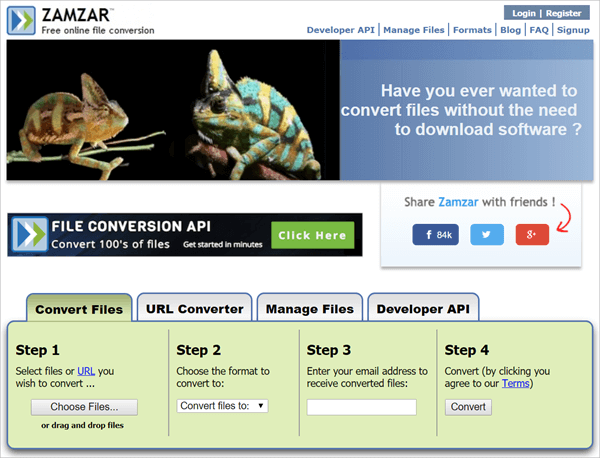 Zamzar is a free, simple and fast online video converter to MP4/MP3 format. It enables you to convert video from computer, or download video from sharing sites like YouTube, Dailymotion, Metacafe, Break, etc. and then convert the video to any popular format. This free MP4 converter online also guarantees that the output file is of the best quality and no less. Please note that you have to enter the email address to receive the converted files. 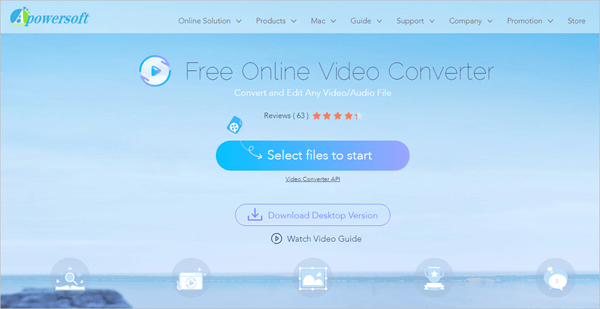 Aconvert is another all-around converter website, which allows you to convert not only video but also audio, image, document, ebook, archive, webpage, and more. Lots of output video formats are supported, including MP4, MKV, RM, VOB, SWF, etc. This converter gives you the options to change the video size, video bitrate, frame rate and video aspect. Please note the maximum video size of this video online converter is 200MB. Apowersoft Free Online Video Converter does best in converting videos online. It is free, easy to use and has a simple user interface. The output formats cover nearly all popular video/audio formats like MP4, AVI, MOV, MP3 and more. Before conversion, you’re allowed to trim video, adjust video size, change video effects and add watermarks. Please note that you need to download the launcher if you are the first time to use the converter. All these 5 free online video converter mentioned above are really convenient for occasional use. But there are also some limitations, such as the size limit on video file, fewer options of output formats, slow in conversion speed, produce output file of low quality, and higher risk in exposing video content. Considering the restrictions of online video converter, here we’d like to recommend you the best desktop video converting software – Fucosoft Video Converter. With it, you can effortlessly convert any video files to any popular format with fast conversion time and high-quality output. Plus, you can download or record 4K/HD videos, customize videos through advanced editing features, and burn videos to DVD/Blu-ray Discs. Run the program and click the “Add Files” button in the “Convert” section, then select the files you want to convert. Enter the drop-down list of the output format, and select the output format like MP4, MOV, MKV, AVI, WMV, etc. Now click “Convert” to convert each video one by one or click “Convert All” to start converting all video files.